GLPGP has rocketed into 2019 with a burst of exciting activities. We are receiving—and acting on—ever more requests for support from developing country governments that have prioritized national LPG scale-up for clean cooking within their energy mix, to address pressing health, air pollution, and forest degradation challenges. We are collaborating with LPG sector partners on important technological innovations for LPG renewability and affordability, such as bio LPG production and Pay-As-You-Cook LPG systems and business models. We are excited to broaden and deepen our collaboration with the Climate and Clean Air Coalition as a Partner, building on two years of active engagement. Through our consumer microfinance programs, we are deepening the body of evidence around the affordability of LPG for low income families and its impacts on their health and wellbeing. We will share our continuing learnings through webinars, articles, and speaking engagements at conferences globally. After two years of active engagement with the Climate and Clean Air Coalition (CCAC), GLPGP is now formally a Partner in the CCAC. GLPGP has also joined CCAC's Urban Health Initiative, in addition to its continued support to the Household Energy Initiative. Bio LPG is climate friendly LPG made from renewables including agricultural products and animal fats. It is chemically and functionally identical to fossil fuel LPG, and can be stored, distributed and produced using existing LPG distribution and storage infrastructure, cylinders and stoves. Commercial production of bio LPG in 2018 globally was over 100,000 tons, but is projected to grow rapidly as technical innovations that lower cost and increase process efficiency continue to be made. All current commercial bio LPG output is propane, produced as a by-product of hydrogenating vegetable oils and animal fats to make renewable diesel. GLPGP is following closely the continuing technical and economic development of bio LPG, to determine when and under what conditions bio LPG production and use will become feasible in developing country markets as a substitute for conventional LPG or as a blend-in with conventional LPG, to lower its carbon footprint. GLPGP focuses on assisting developing countries to increase the scope of their LPG sectors, in order to deliver urgently-needed reduction of Household Air Pollution, reduction of pressure on forest resources and on the environment, and reduction in carbon footprint from biomass use. These benefits from using conventionally sourced LPG will be even greater once a transition to economically viable bio LPG occurs in the future. GLPGP welcomes interested entities to work with it in the emerging arena of bio LPG. Envirofit International is a social enterprise that develops innovative smart energy products and services to improve lives on a global scale. In Kenya, the company has launched SmartGas, a "Pay-As-You-Cook" LPG business line. GLPGP spoke with Jessica Alderman, Envirofit’s Director of Communications and Public Relations, about the SmartGas product. Ms. Alderman manages Envirofit’s global communications, public relations, and marketing operations. She founded Envirofit’s women’s empowerment programs, and works closely with Envirofit’s subsidiaries and international partners to create and implement marketing campaigns and women’s empowerment programs that can be adapted and delivered locally. GLPGP: Why did Envirofit select a Pay-As-You-Go approach as the model for your LPG business? Jessica Alderman (hereafter JA): One key challenge is customers’ income levels and [a lack of] LPG accessibility in smaller portions. Because of the upfront cost of the filled LPG cylinder, LPG is perceived among our target customer base as expensive. In Sub-Saharan Africa, many people earn income on a daily basis and budget their daily expenditures accordingly. With SmartGas, our customers’ average top-up amount is just US$1.60, for a couple days’ worth of gas. GLPGP: What has been your experience with selling LPG via SmartGas? JA: The great thing about LPG for customers is its aspirational aspect. Our customers want to be able to cook at the click of a button, and Envirofit’s SmartGas can provide that in a Pay-As-You-Go, affordable manner. Because customers are only paying for gas when they need it, our enterprise has been very successful. I have been with Envirofit for several years working across its product lines. It is often very hard to sell an improved biomass cookstove. With SmartGas, there has been almost no need to market it. Selling LPG in our SmartGas cylinders is great in that it is very visible; our model also allows our staff to make frequent visits to customers’ homes. GLPGP: Could you describe the SmartGas experience from the customer’s perspective? JA: In the beginning, we lead marketing sessions to educate the local community in the benefits of using LPG through our SmartGas mechanism. The customer can sign up immediately by simply calling the Envirofit Call Center. There is no down payment involved. If a customer decides to use our services, we will rent them the SmartGas cylinder [with a smart meter], go to their home to install it for them, and train them on how to correctly use it. After that, the customer can start to cook immediately. The customer pays per meal or per time they use SmartGas via the M-PESA mobile money system, and they can see how much gas they have left through the smart meter on the cylinder. When they are almost out of gas, they can simply contact the Call Center and schedule a refill of the cylinder to be delivered by Envirofit. GLPGP: Could you give an overview of SmartGas’ current operations and future plans? JA: Our pilot program was launched successfully in Kenya in 2018, with customers currently in the thousands. Our biggest challenge now is getting enough funding to scale up. Because customers are very satisfied with our service, referral rates for new users are very high. Our target customers are primarily charcoal users who use LPG as a secondary source of fuel, and people who want to use LPG but can only use it sparingly or buy it cheaply from illegal suppliers. We are currently active in Kenya, but are looking at other markets including Ghana, India, Rwanda, Guatemala, and Nigeria. We are also looking at a carbon offset program for SmartGas. To share its work with key financial inclusion sector stakeholders, GLPGP organized a February 2019 webinar with the Consultative Group to Assist the Poor (CGAP). Richenda Van Leeuwen, GLPGP's Chair, International Institutions moderated the webinar, which explored various consumer financing approaches for expanding access to clean cooking fuels for household energy, including microfinance, “pay-as-you-cook” and digital finance. Meixi Gan, Program Manager, Energy and Microfinance at GLPGP shared lessons from its microfinance program in Cameroon and Kenya. Sebastian Rodriguez, CEO of KopaGas outlined its innovative business model enabling customers in Dar es Salaam, Tanzania to purchase LPG fuel on a Pay-As-You-Cook basis, while Alexander Sotiriou, a financial sector specialist at CGAP shared insights from the use of microfinance, pay-as-you-go and digital finance in the off-grid solar sector, and how they could inform future clean cooking innovations. Presentations from the webinar are available on GLPGP’s website here. Making Clean Cooking Affordable, a blog post co-authored by Meixi Gan and Richenda Van Leeuwen, was recently featured on FinDev Gateway’s blog homepage. It outlined the benefits and challenges of using microfinance and “pay-as-you-cook”, respectively, to scale access to clean cooking with LPG for low income families in developing countries. Equipment distribution to participants in Bafia, Cameroon. GLPGP’s microfinance program, Bottled Gas For Better Life continues to add to the body of evidence showing how clean cooking with LPG improves lives, and the ability of poor households to re-pay their LPG equipment loans over 6 months. To date, 509 households have participated in Phase II in Cameroon, and 69 in the pilot in Kenya. Loan repayments in both Cameroon and Kenya are ongoing in March 2019. In Cameroon, more than 90% of loaned capital has already been re-paid to date in the ongoing project, despite civil disruption that affected early loan collections in some communities. In Kenya the program is achieving a 100% repayment rate so far. This high level of repayment is attributed not only to thorough credit screening by Equity Bank, the key financial partner, but also the use of digital finance through Equity Bank’s mobile money platform, facilitating timely repayments. In Cameroon, baseline surveys of loan recipients showed that 43% of households had monthly income ranges equivalent to US$0.55-US$1.09 per capita per day, while Cameroon’s average per capita income in 2017 was US$3.96 per day. Wood had been the primary cooking fuel used by most participants across urban, peri-urban and rural areas. Follow-up surveys are conducted six months later, after the completion of loan repayments. Preliminary data from one community with 100 households showed time savings from switching to LPG and sustained use of LPG, albeit with a high level of stacking with other fuels. Detailed results will be available when data collection is complete. GLPGP has been working together with the government of Senegal to conduct a study of LPG development outside Dakar. While LPG use is prevalent in the greater Dakar area, many secondary cities as well as rural parts of the country remain underserved. Over half of the total LPG is consumed by around a quarter of the total population of Senegal, representing consumption of about 31kg/capita/year in the Dakar area. In other regions consumption is only about 3.8 kg/capita/year, a large difference in usage. GLPGP is evaluating actions that can be taken to help address the wide disparity in LPG use for clean cooking between Dakar and other parts of the country. GLPGP senior technical experts are preparing a set of recommendations, including supply chain investment projections and potential adjustments to existing business models, to support greater uptake and address challenges around cylinder interchangeability. GLPGP’s Kenya Country Manager, Elizabeth Muchiri, recently joined a delegation of researchers from Emory University and the U.S. National Institutes of Health (NIH) who are working on the HAPIN randomized controlled trial of LPG fuel and stoves across four countries, including Rwanda. In Kigali, the delegation met with officials from Rwanda’s Ministry of Infrastructure (MININFRA) to discuss extending availability of LPG to trial participants in the Kayonza region after the ongoing trial concludes. GLPGP is helping this effort through its relationships with LPG suppliers and distributors in the region, as well as providing advice on microfinance options to keep LPG fuel purchase affordable for participants. Renzo Bee, GLPGP Chair of Policy, Regulation & Development Advisory Group, will share his insights on enhancing LPG affordability and availability as a keynote speaker at the LPG West Africa 2019 Forum, a major West Africa regional LPG event taking place from April 9-11 in Lagos, Nigeria. GLPGP is a Supporting Organization of the Forum. Alex Evans, Chair of GLPGP’s Operating Committee, presented at a USAID-organized Air Pollution Solutions Workshop at Columbia University, New York, USA on March 14-15. The workshop aimed to foster partnerships to combat urban air pollution (including household air pollution) following the World Health Organization's successful first Global Conference on Air Pollution and Health in late 2018. Practitioners discussed emerging capabilities for precise air pollution measurement, setting up urban sensor networks to measure air pollution, and ways to motivate political leaders to value public health and prioritize air pollution interventions. Mr. Evans presented on LPG’s value in providing energy security and mitigating air pollution in cities, and the priority actions needed to improve penetration of LPG for cooking, especially among lower income households. The event was opened by Harriett Baldwin, MP, Minister of State for Africa, Foreign & Commonwealth Office and Minister of State for International Development. It focused on accelerating clean energy innovations and supporting impact at scale, especially in Africa, through improved alignment of supportive policy and investment. Keynote speakers included Rachel Kyte, Chief Executive Officer of Sustainable Energy for All (SEforALL) and Special Representative of the UN Secretary-General for Sustainable Energy for All, and Amadou Hott, Vice-President for Power, Energy, Climate Change and Green Growth of the African Development Group. Dr. Puzzolo spoke about four major types of innovation in the LPG sector: policy, fuel – including bio LPG, business models, and consumer finance, all of which are needed to support large scale, sustainable LPG market development and affordable LPG provision to consumers. Elizabeth Muchiri, Country Manager for Kenya, recently represented GLPGP at the Working Group meeting of the Climate and Clean Air Coalition (CCAC) in Nairobi, Kenya. A range of topics were discussed, including a 2018 short-lived climate pollutant science update, the launch of CCAC’s African Regional Assessment, and the upcoming 2019 High Level Assembly in New York City. Side events were also held focusing on household air pollution, health, and black carbon emissions. Ms. Muchiri also represented GLPGP at the Sankalp Africa Summit in Nairobi, Kenya. The interactive meeting was attended by entrepreneurs, impact investors and investors. At the Tackling the Missing Middle side event, Ms. Muchiri highlighted the fact that LPG is often overlooked as a solution to clean cooking in favor of less environmentally friendly and healthy fuels, due to the mistaken perception that it is unaffordable for the poor. On January 24-25, the US National Institutes of Health convened its sixth expert meeting of the Clean Cooking Implementation Science Network (ISN) to advance the science of uptake and scale-up of clean cooking in the developing world. Dr. Elisa Puzzolo, GLPGP Director of Research, Monitoring & Evaluation, and Richenda Van Leeuwen, GLPGP Chair, International Institutions presented and participated in discussions on concepts for future work to advance the clean cooking sector through implementation science. Invited speakers included Dr. Kalpana Balakrishnan from Sri Ramachandra University, India, and Dr. Thomas Clasen from Emory University and principal investigator for the HAPIN trial. Their presentations covered the “Status and Directions of India’s Programs on LPG Equitable Access for Clean Cooking” and the “Effects of a large-scale distribution of improved cook stoves on air quality and acute respiratory infections: a cluster randomized controlled trial in Western Province, Rwanda”, respectively. 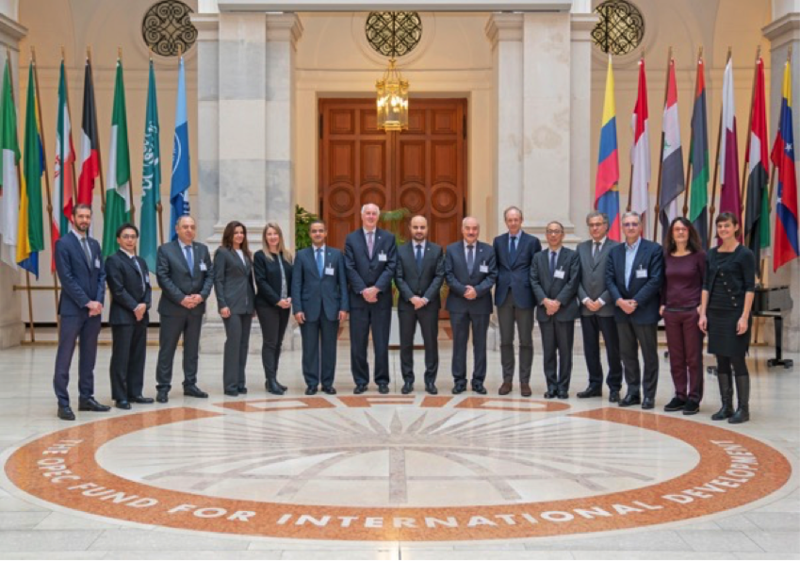 GLPGP Chairman, Kimball Chen attended the OPEC Fund for International Development (OFID)’s Executive Committee Meeting of the Energy Access Platform (EAP) in Vienna, Austria. During the Committee Meeting, GLPGP highlighted the importance of EAP's work leading advocacy and policy, in addition to supporting individual energy access projects to advance the Sustainable Development Goals.